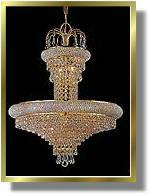 Crystal Chandeliers, Quality Chandeliers at factory direct prices. Over 1000 Chandeliers to choose from. Crystal, Alabaster, Wrought Iron, Maria Theresa. Satisfaction Guaranteed. We are proud to show you our extensive range of chandeliers all of which are manufactured in Spain world renowned for its quality. 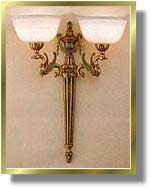 As you will see, we have , Alabaster, Maria Theresa, Traditional, Neoclassical and we can manufacture any style chandelier according to your designs to compliment your projects. 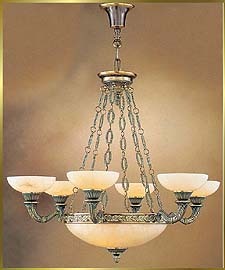 Below is some links to our chandelier galleries and information pages. To view our web site in its entire content please click on the above picture above to enter our galleries. 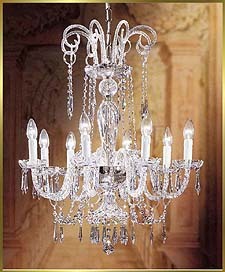 There, you can pick any of our galleries to view many styles like crystal chandeliers. If you have any questions regarding our products, please feel free to contact us at: 1-877-499-6753. 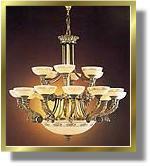 Our Crystal Chandeliers are manufactured using the highest quality materials. They also come with our 30 days money back guarantee and 10 Years warranty. What makes our Crystal Chandeliers different from the other suppliers is that our chandeliers are dressed with 100% Full Lead Crystal. These are one of the highest quality crystals that you can see on high end Crystal Chandeliers. Crystal is actually glass with a Lead Oxide content. The purpose of the Lead Oxide is to increase the density of Crystal so that when it is cut and polished, it will give the most colors. Crystal Chandeliers dressed with a high lead conten crystal will give out rainbow colors all around them. The maximum amount Lead Oxide that can be put inside the crystal is about 30%. The reason for that is, after 30%, the crystal starts getting dark and loose its transperency. 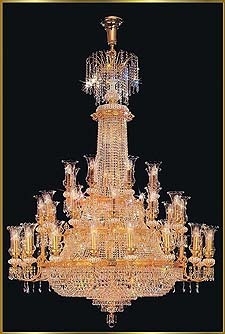 Also, all of our Crystal Chandeliers are 24Kt Gold plated. That means, they are acually coated with a very thin layer of gold. It is not an artificial color, it is the real thing. They are also lacquered with a special lacquer to protect them from tarnishing. 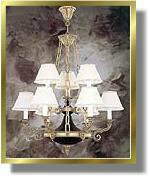 Please click here to visit our Crystal Chandeliers Gallery.